Michigan Wolverines Riddell full size replica helmet autographed in silver by Heisman Trophy winner Charles Woodson and inscribed Heisman 97. 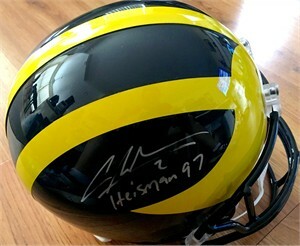 From a paid signing with GTSM, with Woodson's personal GTSM hologram on the helmet and certificate of authenticity from AutographsForSale.com. ONLY ONE AVAILABLE FOR SALE.